"Jesus . . . has now been honored for about three hundred years; having done nothing throughout his lifetime that was worthy of fame, unless anyone thinks it a very great work to heal the lame and the blind and to cast out demons in the towns of Bethsaida and Bethany." This statement shows that it was commonly accepted that Jesus performed miracles in the villages of Bethsaida and Bethany as recorded in the Bible. Mark 8:22 states that Jesus healed a man who had been blind since birth in Bethsaida, and John 12:1 records that Jesus rose Lazarus from the dead in Bethany. 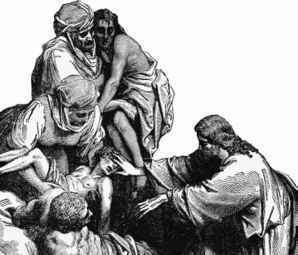 'Jacob of Kephar Sama arrived to heal him in the name of Jesus [Yeshua]. 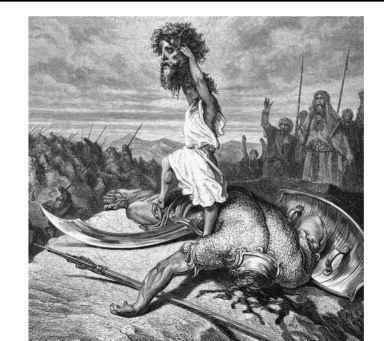 But Rabbi Ishmael did not permit it. He said:"Ben Dama, you must not do so!" The early Jewish Rabbis of the first century did not deny that Jesus performed miracles, but they tried to attribute them to acts of sorcery. "During the time of Passover they executed Yeshu (of Nazareth). An announcement was made for forty days before this saying (Yeshu of Nazareth) will be stoned in that he has practiced sorcery and deceived and led Israel astray. Let everyone who knows contrary, come and plead for his defense. But they found nothing in his defense and crucified him." "And He was casting out a demon, and it was mute. So it was, when the demon had gone out, that the mute spoke; and the multitudes marveled. But some of them said, "He casts out demons by Beelzebub, the ruler of the demons." Others, testing Him, sought from Him a sign from heaven. But He, knowing their thoughts, said to them: "Every kingdom divided against itself is brought to desolation, and a house divided against a house falls. "If Satan also is divided against himself, how will his kingdom stand? Because you say I cast out demons by Beelzebub. "And if I cast out demons by Beelzebub, by whom do your sons cast them out? Therefore they will be your judges. "But if I cast out demons with the finger of God, surely the kingdom of God has come upon you." Then some of the scribes and Pharisees answered, saying, "Teacher, we want to see a sign from You." Therefore they said to Him, "What sign will You perform then, that we may see it and believe You? What work will You do? "Our fathers ate the manna in the desert; as it is written, 'He gave them bread from heaven to eat.' "
Then Jesus said to them, "Most assuredly, I say to you, Moses did not give you the bread from heaven, but My Father gives you the true bread from heaven. "For the bread of God is He who comes down from heaven and gives life to the world." Then they said to Him, "Lord, give us this bread always."